This exciting release marks the first solo recital disc in some years by the world's most celebrated violist Yuri Bashmet, and features high quality arrangements mostly not recorded before. 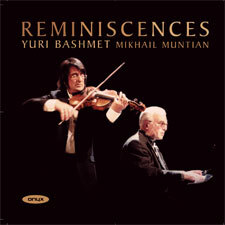 Reminscences is a highly personal disc of Bashmet favourites and encores played over 30 years with his long-time piano partner Mikhail Muntian (who premiered Shostakovich's Viola Sonata). Marais' haunting music for viol suits the viola well and forms the backbone of the recital, just as it did for his Carnegie Hall debut. Bashmet played Benda's Grave at the Beslan Memorial concert with Gergiev in 2005, and the other beautiful arrangements (some by Bashmet's teacher, the legendary Vadim Borisovsky) throw a new light on many old favourites.